This article is about a type of spirit. For other uses, see Loa (disambiguation). "Lwa" redirects here. For abbreviations "LWA", see LWA (disambiguation). 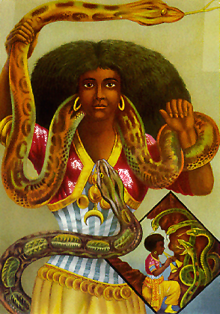 Printed in Hamburg in the 1880s, this poster of a snake charmer gave rise to the common image of the loa Mami Wata. The word loa (or lwa) comes from the French les lois; "the laws" in English. The enslaved Fon and Ewe in Haiti and Louisiana syncretized the loa with the Catholic saints—vodoun altars will frequently display images of Catholic saints. For example, Papa Legba is syncretized with Saint Peter or Lazarus of Bethany. Syncretism also works the other way in Haitian Vodou and many Catholic saints have become loa in their own right, most notably Philomena, the archangel Michael, Jude the Apostle, and John the Baptist. In a ritual the loa are called down by the houngan (priest), mambo (priestess), or the bokor and the caplata (sorcerers and witches) to take part in the service, receive offerings, and grant requests. The loa arrive in the peristyle (ritual space) by mounting (possessing) a horse (ritualist) in Creole referred as "Chwal"—who is said to be "ridden". This can be quite a violent occurrence as the participant can flail about or convulse before falling to the ground,:62 but some loa, such as Ayizan, will mount their "horses" very quietly. Certain loa display very distinctive behavior by which they can be recognized, specific phrases, and specific actions. As soon as a loa is recognized, the symbols appropriate to them will be given to them. For example, Erzulie Freda will be given a glass of pink champagne, she is sprinkled with her perfumes, fine gifts of food will be presented to her or she even puts on her jewelry; Legba will be given his cane, straw hat, and pipe; Baron Samedi will often fall flat on the floor and the vodousants around him will dress him and prepare him as they do in a morgue with cotton in his nose. Sculpture of the loa Legba, who serves as the intermediary between the loa and humanity. Legba often appears as an old man, but in Benin, Nigeria and Togo, he is typically young and often horned and phallic. Once the loa have arrived, fed, been served, and possibly given help or advice, they leave the peristyle. Certain loa can become obstinate, for example the Guédé are notorious for wanting just one more smoke, or one more drink, but it is the job of the houngan or mambo to keep the spirits in line while ensuring they are adequately provided for. There are many families or "nanchons" (from "nations") of loa: Rada (also Radha), Petro (also Pethro, Petwo), Nago, Kongo, and Ghede (also Guede, or Gede), among others. The Rada loa are generally older, as many of these spirits come from Africa and the kingdom of Dahomey. The Rada Loa are mainly water spirits and many of the Rada loa are served with a water. The Rada are "Cool" in the sense they are less aggressive than the Petro. They include Legba, Loko, Ayizan, Damballa Wedo and Ayida-Weddo, Maîtresse Mambo Erzulie Fréda Dahomey, La Sirène, and Agwé. Many of these spirits are served with white (as opposed to the specific colours of individual loa). The Petro loa are generally the more fiery, occasionally aggressive and warlike loa, and are associated with Haiti and the New World. They include Ezili Dantor, Marinette, and Met Kalfu (Maitre Carrefour, "Master Crossroads"). Their traditional colour is red. Originating from the Congo region, these loa include the many Simbi loa. It also includes Marinette, a fierce and much feared female loa. Originating from Yorubaland, this nation includes many of the Ogoun loa. The Guédé are the spirits of the dead. They are traditionally led by the Barons (La Croix, Samedi, Cimitière, Kriminel), and Maman Brigitte. The Ghede as a family are loud, rude (although rarely to the point of real insult), sexual, and usually a lot of fun. As those who have lived already, they have nothing to fear, and frequently will display how far past consequence and feeling they are when they come through in a service—eating glass, raw chillis, and anointing their sensitive areas with chilli rum, for example. Their traditional colours are black and purple. ^ a b Anthony B. Pinn. "The African American Religious Experience in America" Greenwood Press, 2005. ^ Anderson, Jeffrey E. (2009). "Hoodoo, Voodoo, and Conjure: A Handbook". p. 83. ISBN 9780313342219. Retrieved 18 July 2016. ^ Ramsey, Kate (2014). "The Spirits and the Law: Vodou and Power in Haiti". p. 56. ISBN 9780226703817. Retrieved 18 July 2016. ^ a b Filan, Kenaz (2006). The Haitian Vodou Handbook: Protocols for Riding with the Lwa. Inner Traditions/Bear. p. 56. ISBN 978-1-59477-995-4.